Malicious destruction in Cumberland’s community forest has people used to seeing brown and green seeing red instead. Sometime last week three or more young teens or pre-teens went into the community-owned forest and chopped down at least a half a dozen cedar trees, some as much as 100-feet tall. “This is really going to upset the 140 people who give money every month towards paying the debt for this forest,” said Andrew Nicoll, president of the Cumberland Community Forest Society. The 150-acre community forest is adjacent to privately held forest land, and about a dozen more trees along the boundary between the two properties were likewise felled. 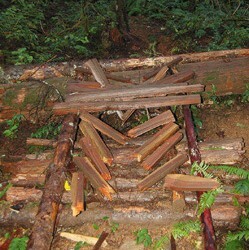 At least another half a dozen trees within the private land were also hacked down. But the vandalism didn’t end there — the culprits also smashed several stunts built by mountain bikers over the years. The destruction within the community forest was primarily along the Tied Knot trail, a trail that was built about 12 years ago to celebrate a marriage. “It’s wanton, it’s just horrible what they’re cutting out,” said Robin Burch, a volunteer trail maintainer with the Forbidden Freeriders Trail Crew. The vandalism has created some potentially dangerous conditions for mountain bikers. 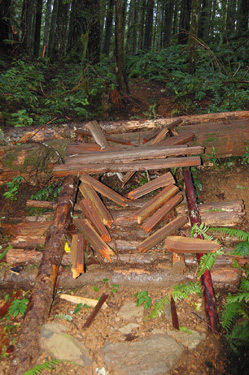 Wooden slats were broken on one structure near the bottom of the Tied Knot trail and, right next to it, a small cedar tree was chopped off about three feet up, leaving a pointy stump. Should a rider have come along and wiped out due to the unexpectedly damaged stunt, it was possible that he or she could have become hurt or impaled by the stump. Burch has already cut the stump off low to the ground to remove that danger, and he continued to clean up other dangers caused by the damage Tuesday afternoon. Four youth believed to be around 12 years old were spotted in the area at the time of the incident. One has since been arrested, admitted to his role in the vandalism and implicated two or three other youth. According to Comox Valley RCMP spokesperson Const. Tammy Douglas, the youth will be dealt with through the Community Justice system rather than the courts. Thousands of local people have donated to the cause and volunteered maintaining the woods, while 140 others have committed to making monthly payments to pay the loan for the purchase. The society also hopes to purchase some of the adjacent private forest land in the future as it is very close to the village.